Happy December! Or, as most crocheters call it, “a million projects on the go at once season”. 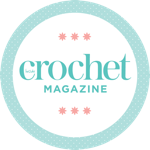 It’s no secret that this is the season for crochet – I love giving out handmade gifts at Christmas time, and over the years they’ve got more and more ambitious. It’s fair to say I’m a bit snowed under (get it? Ha!). In a time of making giant scarves (seriously, I’m loving the blanket-style wraps at the moment but they take AGES! ), cardigans, blankets and jumpers, this simple amigurumi snowman pattern is a life saver – he can be knocked up in no time, and is a real crowd pleaser! Here he is! This is how he’ll turn out if you follow the basic pattern – he’s really easy to accessorise with a scarf, a hat or a smile though! The snowman’s body and head are worked as one continuous piece – making him really easy to assemble! At this point – Attach your safety eyes. Sew on your carrot nose using the tail. Sew on your buttons using gold thread. Stuff the head. At this point – stuff the body. Fasten off, thread tail in to the body of the snowman so that it is hidden. And there you have your basic snowman! Want to make him a snazzy scarf? He’s taken up residence on my parents’ stairs – doesn’t he look festive? This scarf couldn’t be easier. I used a variegated yarn to achieve a striped effect – this is some leftover Artesano Handpainted Alpaca from my Mathlete cowl project. To add tassels: cut 8cm lengths of yarn, fasten them around the stitches on either end of the scarf by folding each length in half and feeding the tails through the folded end. You can cheat on the tassels a little bit – I just didn’t weave in my ends after crocheting the scarf – the ends make two “free” tassels! Because of the buttons, this guy is not a toy. If you want to make him baby safe, you can crochet some simple circles for his eyes and buttons by making 6 stitches into a magic circle and slip stitching the round closed. Use the tail to sew on to your snowman. Also – cats might view your snowman as a nemesis. Try not to let that put you off. My parents’ cat plotting my poor snowman’s demise. Hope you enjoy your snowman!